Whether you are one person or a thousand, Teampage helps you coordinate, communicate, and track all your project-related activity. Quickly capture to-do's. Tag any paragraph as an action to be completed. Use projects, milestones, and tasks to capture the timeline and activity that needs to take place. Your dashboard and daily digest summarize your tasks and events for today and the upcoming week. Email alerts keep you updated on activity connected to your work. Check off tasks as you complete them, and add comments to keep everyone informed of your progress. You're always aware of what's happening across all your projects with dashboards and activity views. Love is never have to ask, “where are we on this project?” again. Teampage makes everything you post actionable. If it’s just a checklist item, or a small deed to be done, you can tag it “To Do”, and a checkbox will appear next to it in the margin. Just click the checkbox to mark it done. Teampage automatically tracks everything marked done and keeps everyone interested informed. Who needs to do this? By when? How long should it take? 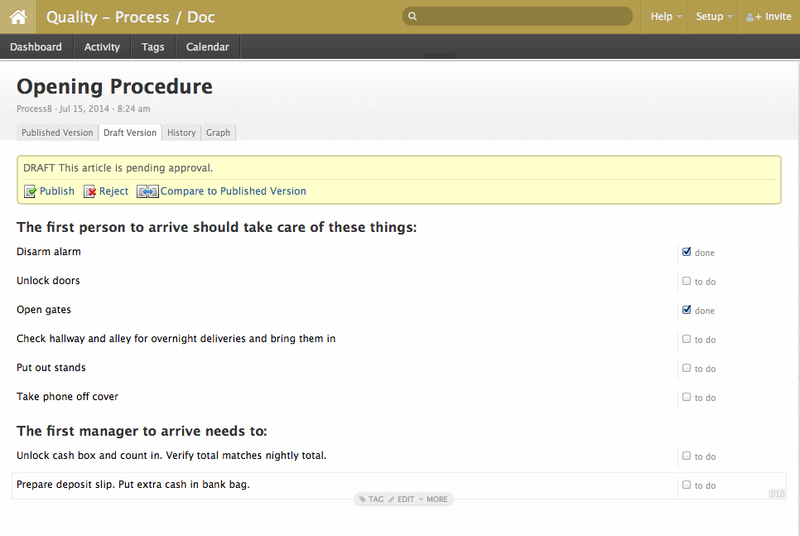 Tasks go beyond line-item to-do/done status, letting you add assignees, due dates, and people to notify. Like everything in Teampage, they can be connected to any paragraph. Or they can stand on their own. Teampage keeps you informed about any activity on tasks you’ve created or to which you’re assigned, so you’re never caught by surprise. 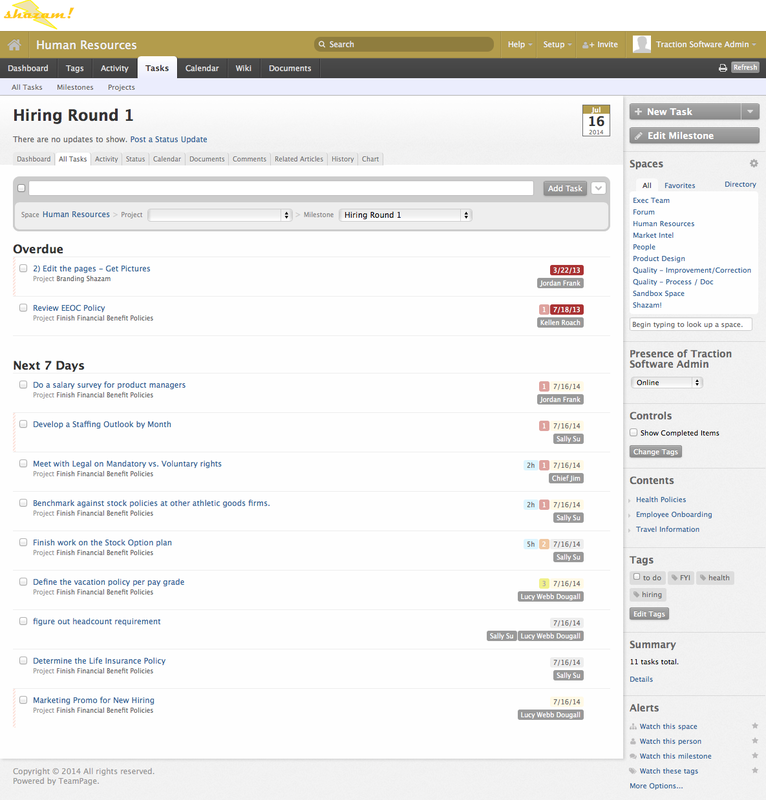 Teampage Project Management features work seamlessly across different permissioned spaces. This means that you can set up a project for a customer or supplier in their space, but post related tasks, milestones, and comments in a private team space. This lets you use Teampage to manage an entire follow-up process, in the context of the customer's project, and share only the conclusion with the customer. This leaves a trail that beats email as a knowledge base hands down. Whether you’re planning beta releases or legal cases, milestones let you collect tasks that need to be done by a certain time. When you move the milestone date, all tasks associated with the milestone’s date move automatically. You can also use milestones without dates to represent abstract phases of a project, and you can quickly and easily shuffle tasks between milestones. Projects let you tie together and track activity on sets of tasks and milestones. They are lightweight enough for everyday activities, yet powerful enough to track large endeavors through their entire lifecycle. The project’s dashboard shows you everything that happens to the project and anything connected to it. You can also post status updates to the project, drag in documents, and quickly add tasks, making it a useful place to come back to over and over. Whether you’re scheduling project meetings or laying out a conference schedule, you can keep everyone’s calendar up to date with events. Events can be contextualized to any paragraph of any post, task, milestone, or project. 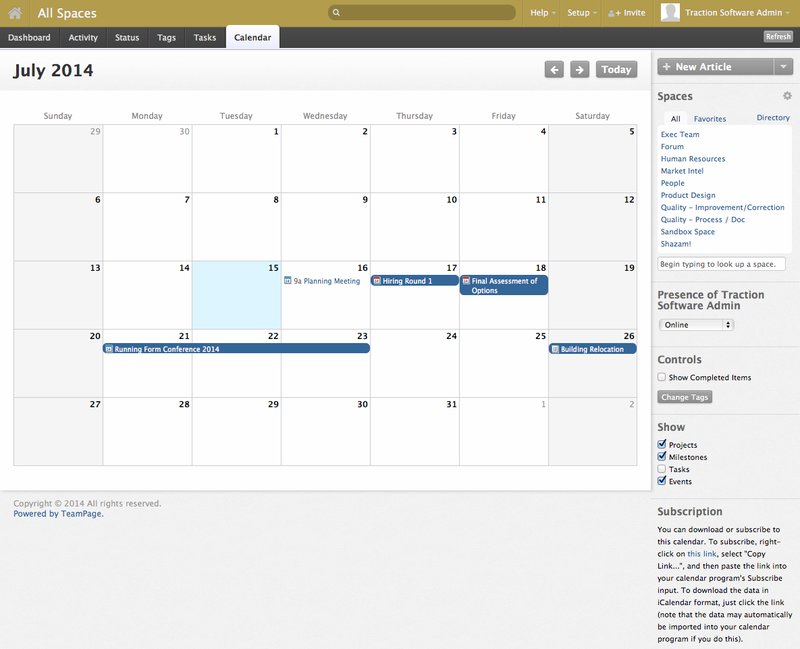 Participants' desktop calendars will automatically synchronize via email invitations. And you can subscribe to an iCalendar feed for any calendar you see in Teampage, letting you see important happenings and committments in your Teampage server when you're reviewing your personal Outlook, Mac, or mobile calendar. Combined with TeamPage’s unique and powerful permissions, search, and effortless sharing, these tools fit together in surprisingly powerful ways to solve many different types of problems, right out of the box. Naturally, your business may need to track, associate, or connect additional information. Your forms may need different fields, and the perfect solution for you may require integration with another system. And that’s where TeamPage shines. With our powerful SDK, Teampage’s reach can be extended and adapted to any business process, from customer support to business development. Master your next project with TeamPage.